This is one of those whiskeys that I've wanted to try for quite some time, but I saw it so frequently on the shelves that I seemed to always have something else I wanted to try first, not worrying that this would become difficult to find. And then it did, at least for a while. 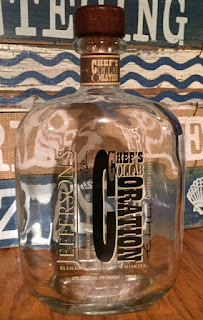 There was a dry spell where I actively looked for the Jefferson's Chef's Collaboration and just couldn't find it. Eventually, though, it came back to the shelves and appears to have a regular place once again. This time I didn't take the chance and finally grabbed a bottle. 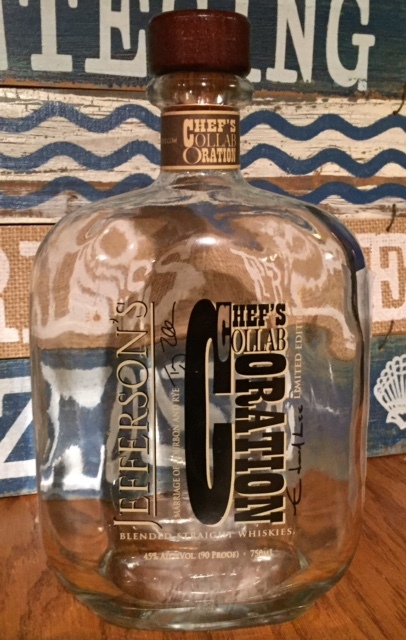 Chef's Collaboration is, as it's name would suggest, a collaboration between Jefferson's and world-famous chef Edward Lee of the 610 Magnolia and Milkwood restaurants in Louisville. It's not a bourbon, however, but rather a blended whiskey, consisting of a blend of bourbon and rye, much like High West's Bourye, Wild Turkey's Forgiven or Smooth Ambler's Contradiction. Some of these blended bourbons and ryes have seen success, and some haven't, but in general I'd heard good things about Chef Lee's design, and I couldn't wait to try it for myself. The first thing that I noticed is its color. I rarely comment on color, as it really seems to have no bearing on anything, but this was noticeably lighter than the other whiskeys sitting next to it on my shelf. I can't say that it's attributable to one thing or another, just merely an observation. The nose is sweet and spicy. I get a lot of vanilla and caramel with the cinnamon spice you'd expect from the rye. In that sense it had me expecting something traditional and bold, despite its lighter color. On the first pour, it came across as very smooth and certainly on the sweeter side. I got distinct molasses flavors, and even a hint of peach. It also had a long, spicy cinnamon finish that really complimented that peach note. The texture is a bit on the watery side, yet the finish was nonetheless long and flavorful. Interestingly, I also got a mintiness in the finish, which created a bit of a strange balance with the spicy cinnamon notes. Long after each sip I got a sort of cooling in the throat, which was particularly noticeable once the spice subsided. Even towards the end of the bottle, after being open for a while, that minty sensation remained. In fact, the flavor profile of this whiskey didn't really change at all over time. It's the most consistent bottle in that respect that I've had in a long time. The only really noticeable change was that I got a slight wood note in the last few pours. Nothing tannic or dry about it, just a slight woody flavor to it. Although this is not an overly complex whiskey, it is nonetheless an interesting and flavorful one. The transition in flavors from front to back is what really sticks out. It's very sweet up front, spicy at the back end, and then it leaves you with a cool minty sensation once the flavors have kind of evaporated. It's a solid pour, and is probably offered at the right price. It's not spectacular, but it is full of flavor and very easy to drink.